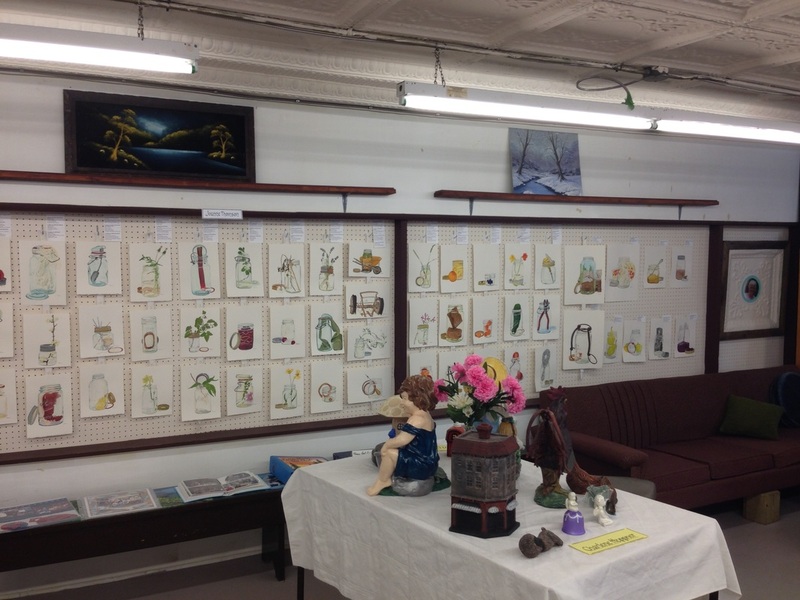 Here are some images from the Mason Jar show that was in Terrace in July 2016. 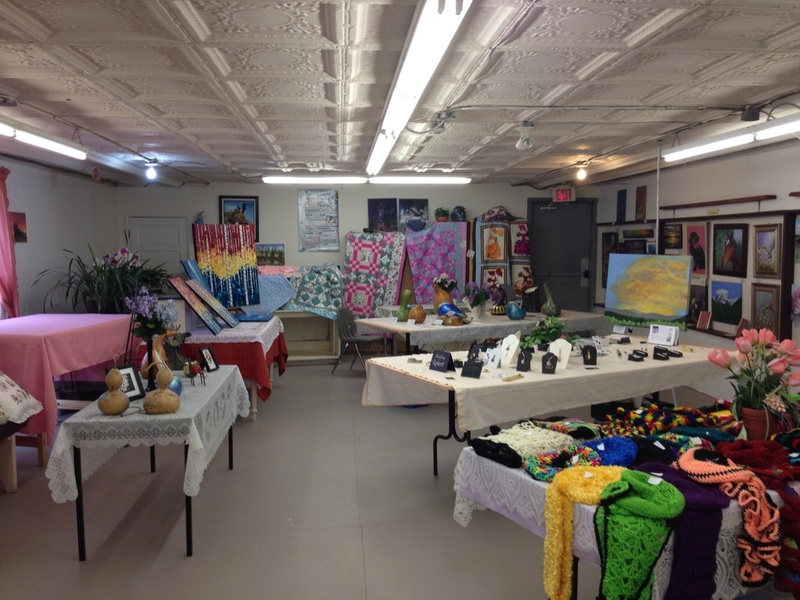 The Terrace Art Association has a Big gallery and the works held their own in the space. Another wonderful sharing of stories and folklore. Thanks TAA! 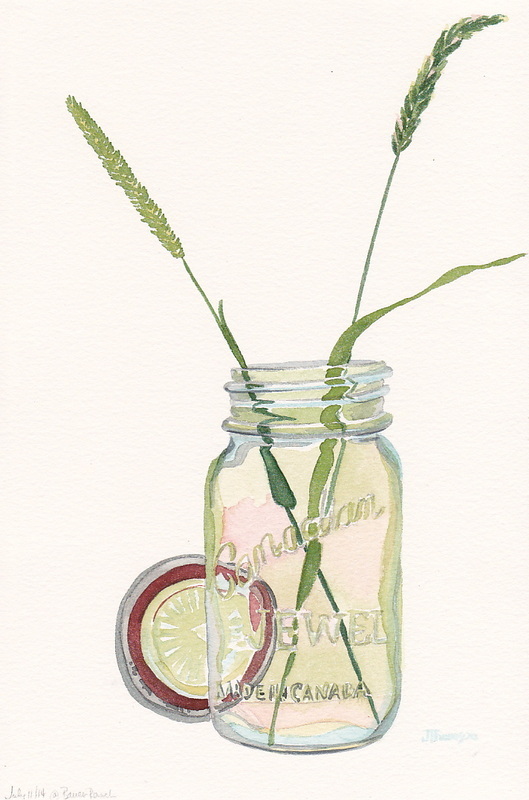 May 27- 29, 2016 The mason Jar series made a guest appearance at the Greenwood Art Club's annual exhibition. Greenwood is the town my Mother was born in and just down the road from the Kerr Creek property where she grew up. It was good to go back and see the land again and visit with the people who still live in that area. They got the works both literally and metaphorically. Notice the wonderful tin panels on the roof. It was once the ceiling for the opera house in Gold rush heydays. In the 40's the height was divided to make two floors to house the Japanese families that were interned there during the war. ​BIG NEWS: the press is really coming on board for this exhibition. I have been interviewed by FOCUS magazine and will be their feature artist for the December issue. AND Preview magazine has asked for information for a short feature article as well! Hopefully there will be more interest generated from those articles too. I am not telling far and wide about the FOCUS article as I want people to be surprised (and a little bit because I want to see it first to be sure it is real!). AND I have finally decided on pricing. All the works will be sold unframed. So easy to mail to you and easy to take home in a suitcase too. I was planning to post the entire inventory list on the sponsor page of my website (141 paintings, plus their poems and prices.) However that has proven cumbersome. So I can send you the list by PDF if you like, then if something strikes your fancy and the image isn't already on the site, you can ask and I'll send you a jpeg of the image. Some of you have your names already on a few paintings so I have them listed as HOLD on the inventory list- and your initials, so please don't think I have forgotten. If you don't see your initials then I have forgotten! So please panic, then call or email me so I can remedy the situation! Looking at this site I realize why I wanted the grant. This earning a living is tough stuff and takes quite a bit of time. 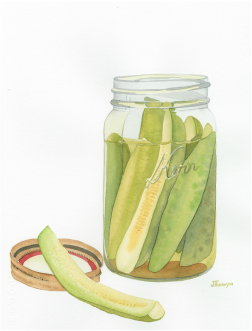 Right now I have the mason jars on the back burner while I finish work on the Gray whale and then the George Jay Mural project. August and September should see concentrated work on the project and there will be paintings done before then too. I am hoping to feature the series at my solo show at the Gage Gallery December 29 - January 14th. It is a good timeline for me to aim for. 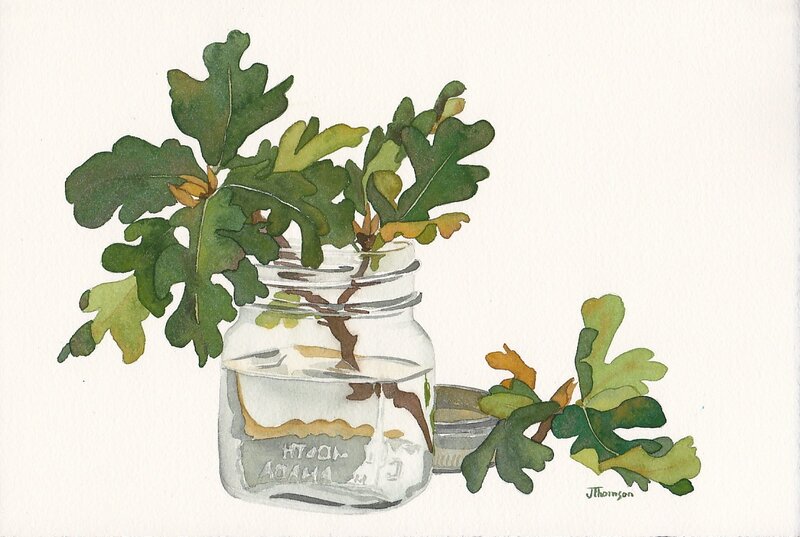 Here is an image of one little on that I painted at Francis King park. Well, I haven't painted a mason jar since late November. It isn't that they have been off my mind. Contrary, they have been, however, I am in waiting and gathering mode and getting things set up so I can dedicate time to them later on this year. 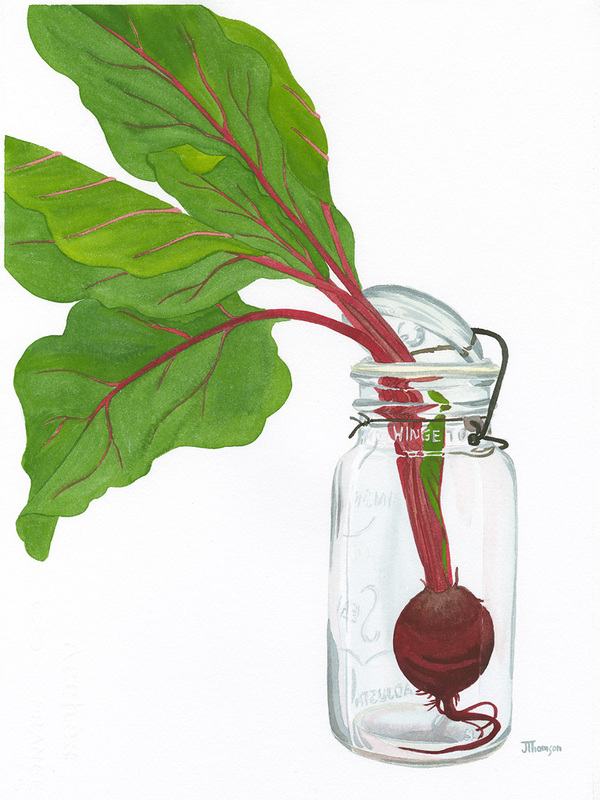 I just scanned in the latest and found that I hadn't painted any for over a month. My studio has been undergoing a re-organization and I took some time off too. Here are a few of the latest. 99 Mason Jar with tea and ornament 7 X 11"
98 Mason Jar with grain 11 X 14"
100 Mason Jar with beeswax candle 7 X 11"
Much progress since my last update. I have sent in an application for a BCArts Council grant to have dedicated time to work on the project. This time I got two wonderful letters of support to send in with my application. I have also sent out two exhibition proposals for 2016 and will be sending out more. 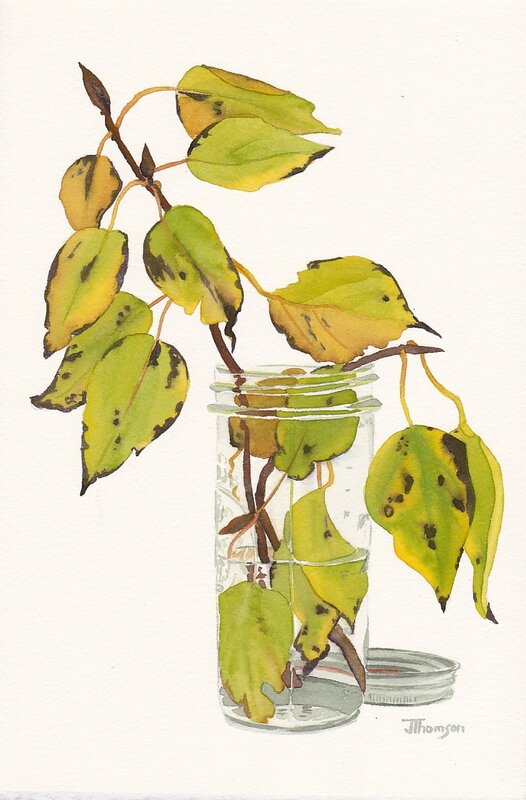 Painting has been slower this fall, however, I am now at 101 completed paintings! It has been a busy with fundraisers, teaching, and said applications. 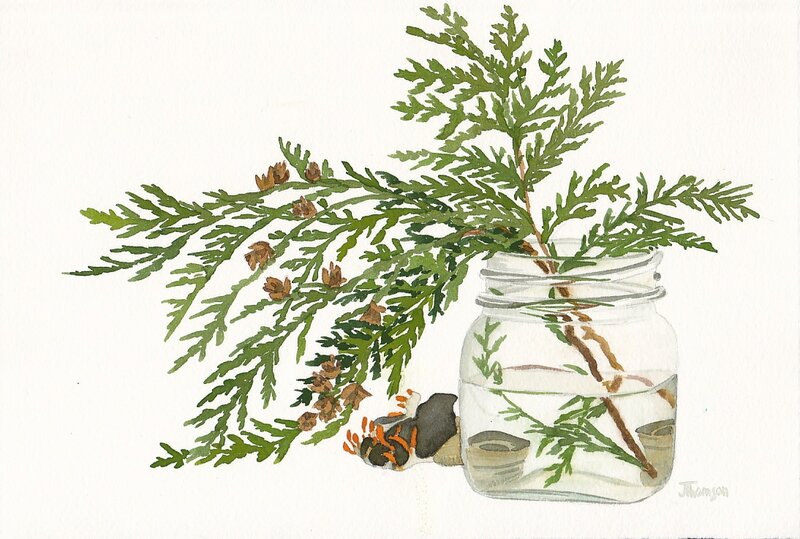 In the Spring I have a residency at Francis King Park and will be using that time to do more mason jar works focusing on the forest artifacts that are applicable to the project as well as some just for fun. 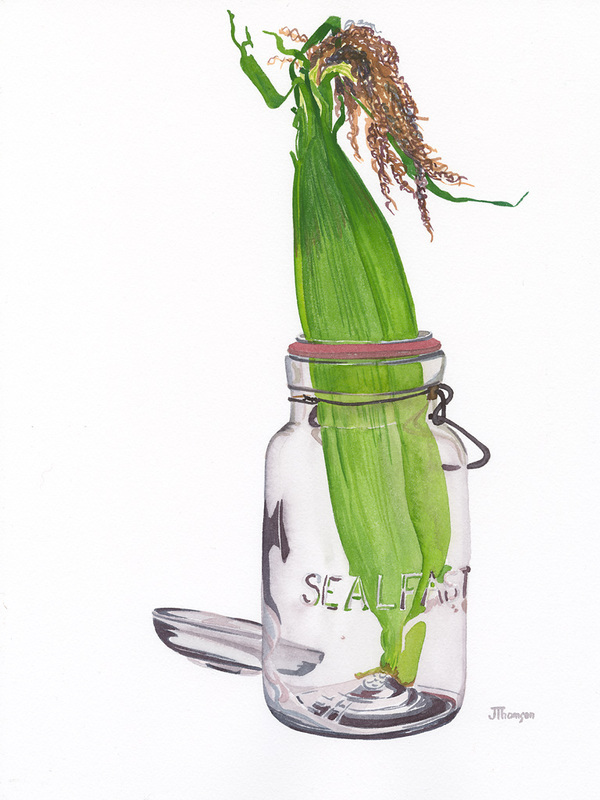 I have had the larger works professionally scanned in now so I have digital records of everything. Here are a few of the larger works from this past summer. September 10, 2014, Not much news this month. I have been too busy travelling to do much painting though I did do one image in England while visiting my cousin Gloria Bullen. She was sharing some of her Father's letters from WW2 and I did one jar with a postcard that he sent from a prisoner of war camp in Korea. It had lettering in Chinese, Japanese, Korean and English. 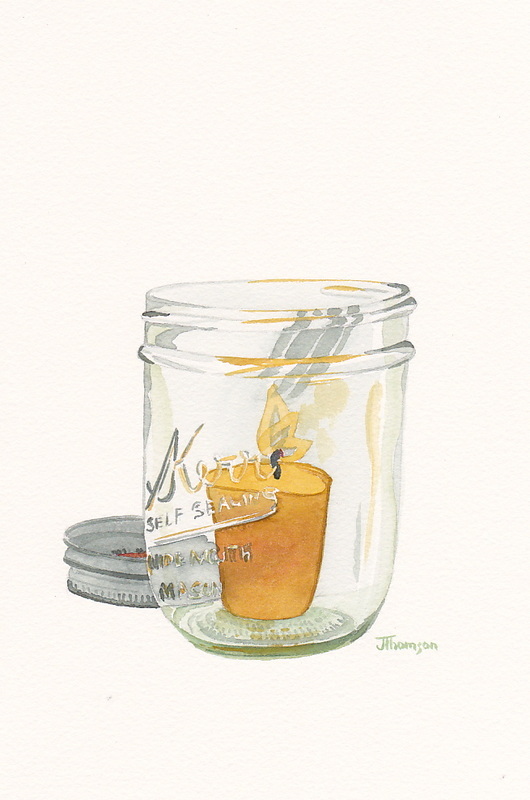 It is the first mason jar in private ownership as I gave it to her as a thank-you for hosting me on my visit. 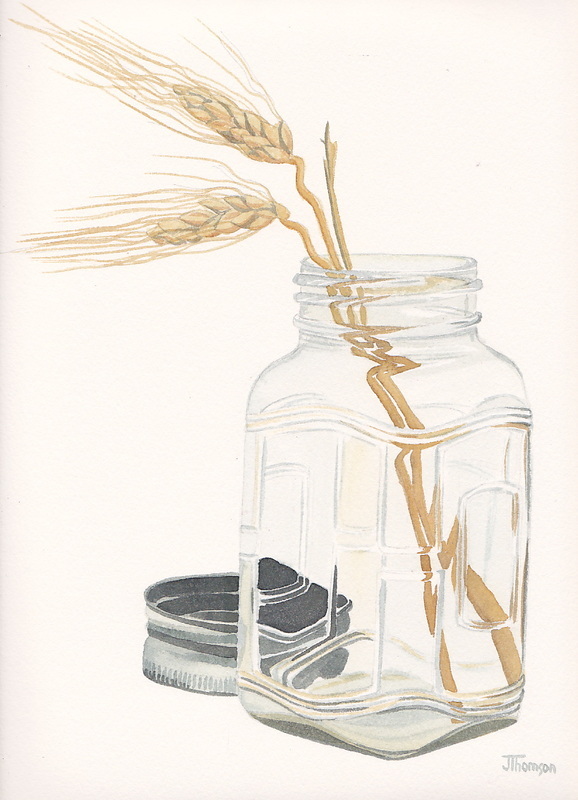 I have also been to Saskatchewan and brought back some artifacts from the railroad that will end up in mason jars. Mostly now I am working on objects from the harvest and will wait to do artifacts again. 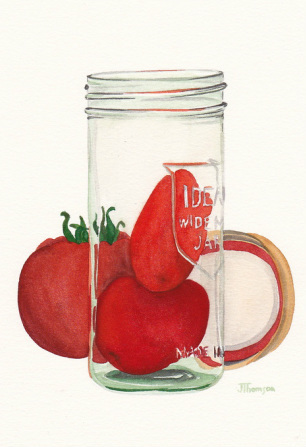 I just finished these tomatoes yesterday. They are here fresh and have since been canned. Life is good and wonderfully abundant. Don't you agree! This month I'll also start working on the application for a BC Arts Council grant again. They haven't actually posted the application yet. I think they wait until later this month. It will be quite a different request than the last one with the work I have done and the direction that is emerging. 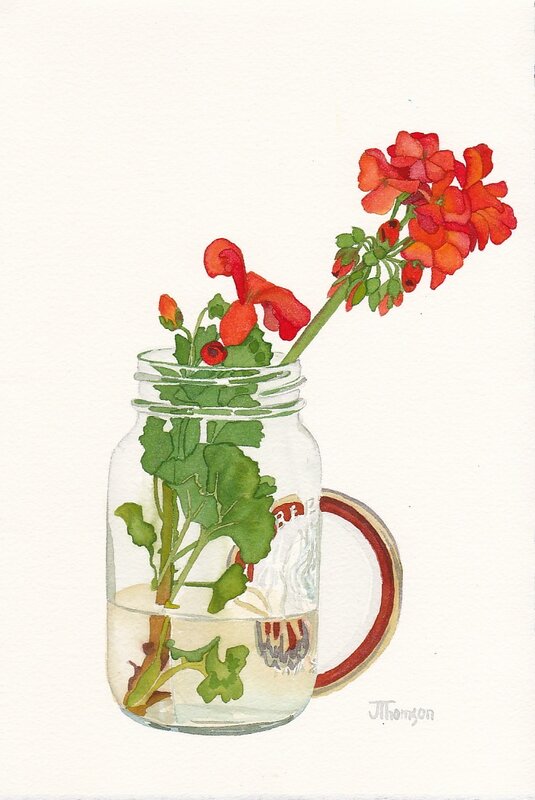 #59 Mason Jar with Two Bits 11 X 14" watercolour on paper. 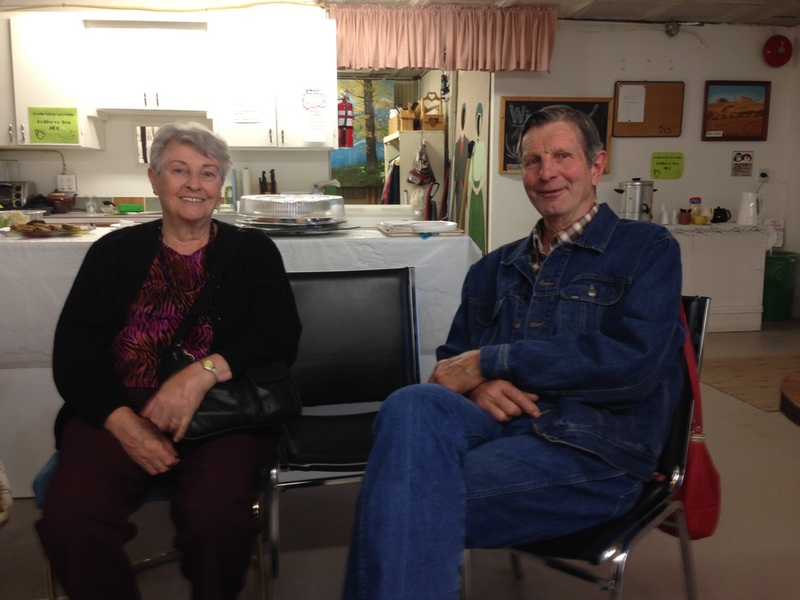 I am back from a quick trip up to Kerr Creek to visit the old procurement and explored the land with the new owners. Even had a chance to help them herd their cows and calves up to the old home site. It was hot and clear and yet there was a breeze most of the time that made the heat quite comfortable. There were also virtually no biting insects- perhaps they prefer the cooler times of day. I had a great time and did 10 paintings 6 were started while I was there and the rest when I got home. I brought wild flowers with me and they needed quick attention. Fred Marshall, the new owner, also gave me a number of artifacts from the site that I'll paint once the flowers and fruit slow down some, these are shingles, brick fragments, charred pine and a few rusted tin cans. Here are a few of the new ones for your enjoyment. 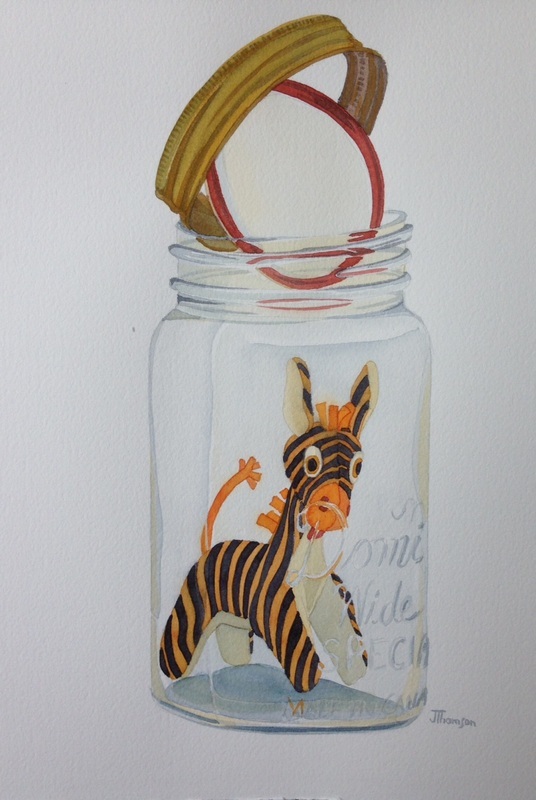 I put the 'two bits' up on the Mason Jar Gallery page if you want more information about it. One thing not there though is that my Mom and my Aunt rode horses all around the hills near Midway. They would each have had a bit for their horse. So the 'two bits' has a multitude of meanings. Below are two I painted on site and the hare bell that I brought home and painted between bouts of canning peaches, apricots and cherries for using later in the series. 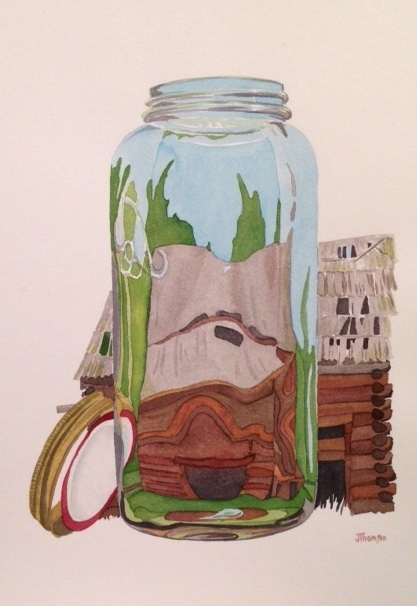 #62 Mason Jar with Settler's Cabin- Sorry for the poor photo- this one is too big to scan. #46 Mason Jar with Dead Dandelion wishes. 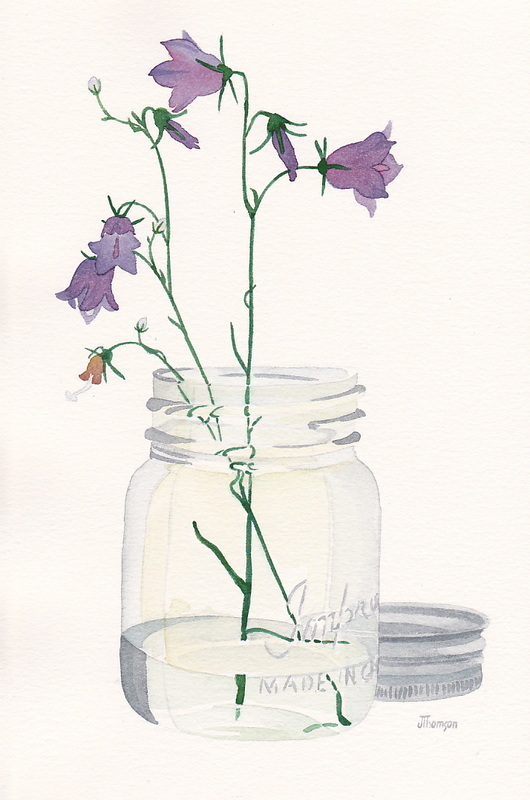 July 3, 2014, I am spending a week as artist in residence at Fort Rodd Hill, unfortunately not as much time as I had hoped to paint, but still fun, and the weather is extraordinary! I have the loan of a few artifacts for the week and finished a painting of the leg wraps called "puttee's but forgot it at the park today. So I'll try to get it home with me tomorrow and scan it for you. Until then here is another one. I painted the living version of this before I went to New York with my Mom and these were waiting for me when I got home. Dead and still holding onto their wishes! Thanks again for your sponsorship. It is very validating. 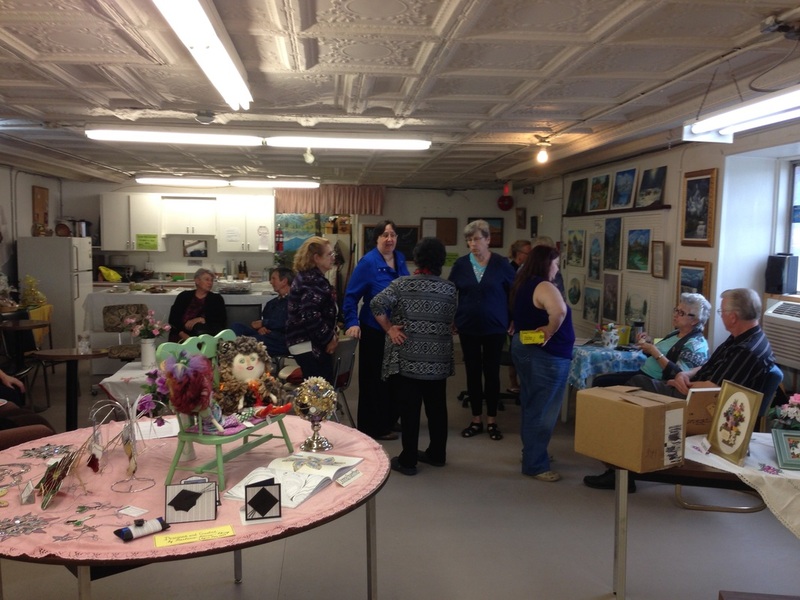 I showed a few at the Gorge On Art on Canada day and they were very well received. You were the first though! I am back from my New York trip with my Mom to see her foster son graduate with a BSc in Radiology. It was an adventure! I have been painting again since I got home. Here is the latest. This one is definitely about me, and influenced by my trip to New York. We went to the Bronx Zoo and I saw real Zebras for the first time. They were absolutely beautiful. This little one has been with me since I was a child. A toy zebra that I have kept for over 50 years! Not sure if there is deep meaning here, but I enjoyed painting the image. 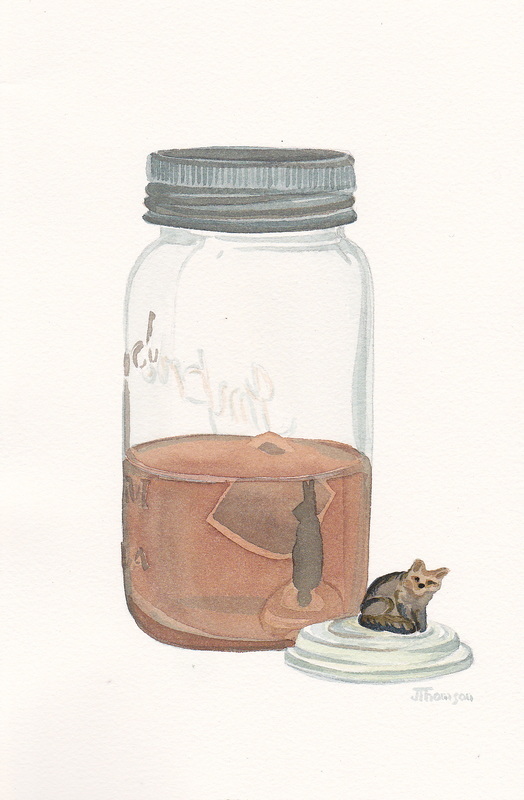 She is in a Dominion jar and the lid can easily be knocked off. Dominion is for Canada, though I guess it could be for any of the Commonwealth countries, for me it means Canada. 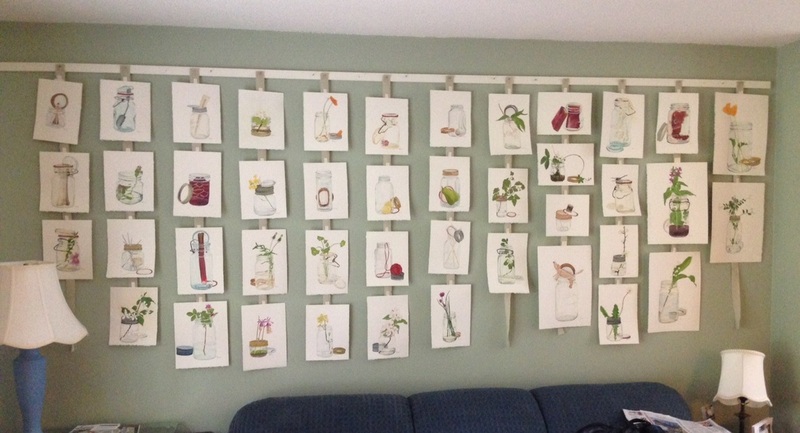 The wall of my living room with most of the mason jar paintings! As promised. You can see it larger if you click on it. Mary was by yesterday and witnessed it then called William in. The works seem to stir up memories in other people as well as in me! What I was aiming for! My son came by too and he raised his eyebrows! I just sent out another newsletter, so thought I'd send you another preview image from the series. 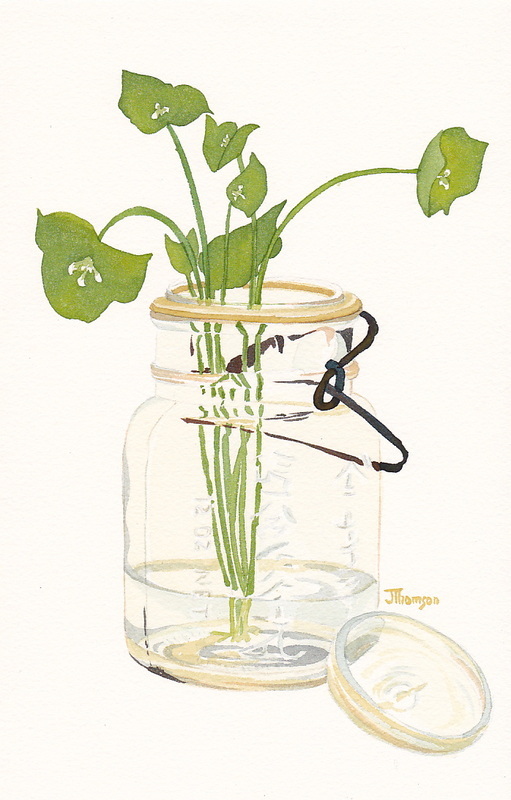 This one is of miner's lettuce, an early Spring green, edible and welcomed. The jar is one of my Aunt Gloria's and has Chinese writing on it. As I was painting it I remembered many things, walks in the forest with my Mom, a trip to Barkerville with my parent's and sister. Discovering wonderful bunches of them near my home in Saanich. 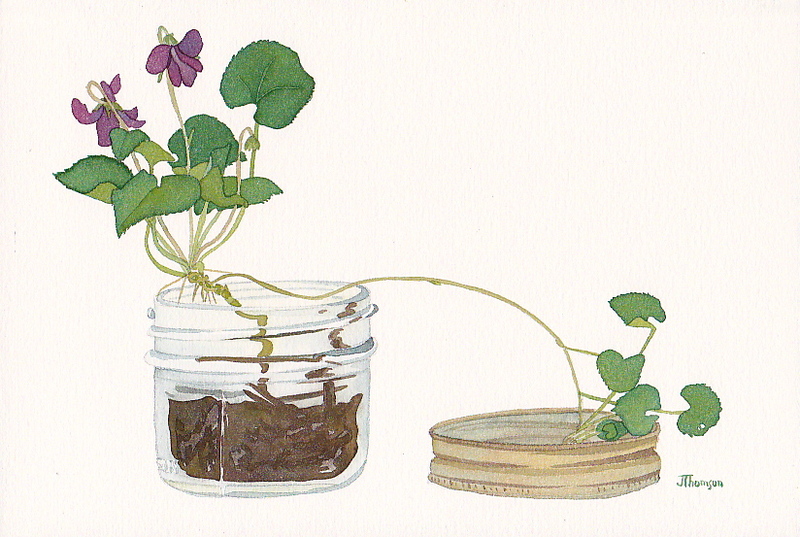 They are such a surprising, adaptable, resilient plant. You will see the number is 27. I am now up to 35. Lot's of ideas still coming, some on hold until the winter months as I work to capture the Spring growth and the memories it evokes. thanks again for the moral and monetary support. I'll post some more images soon. Thank you so much for offering to sponsor this project. I see my path as an artist has been leading here for many years. 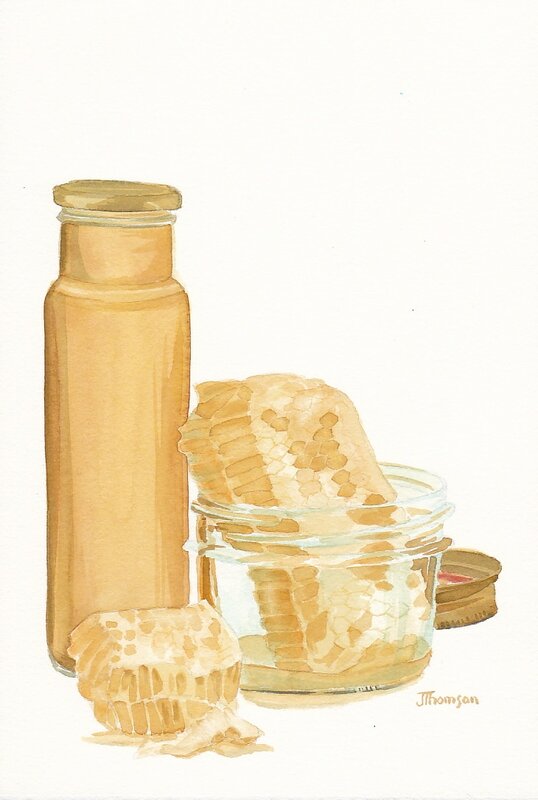 The "Bottled" series was about personal growth and healing. This project is wider, it is about ancestral and societal healing. The title comes from a quote by Richard Rohr, 'the pain which is not transformed is re-transmitted'. I heard the quote last summer and it really resonated with me. I know that pain is part of our human condition, but what about happiness and the simple joys of living? Over the years I have studied happiness and contemplated whether or not it is in our human nature to exist in a state of happiness. I have concluded (and claim the option to change my mind in the future) that we are not wired for happiness. What we pass on to our children are cautions, warnings, information that will ensure their survival. Yes, we also pass on joy and happiness, but sometimes that can be buried under the cautions we send. I think we are able to be contented however, not continually. There is something about humans that demands striving and learning and trying to understand and create. Happiness means being in "The Now" but the now is so transitory that it is very difficult to reside there. Instead, I think that we can live a contented life, one that offers a good balance of challenge and reward, one in which we can take joy in the simple things in life. I was listening to an interview with Adam Phillips who has written the book, Missing Out: In Praise of the Unlived Life, in which he talks about our need to live in the present, the past and the future. He also said that we all live 'haunted by the myths of our own potential'. Intriguing stuff. This body of work is about myth, happiness, loss, legacy and family. It is evolving and growing. As of today- April 12th, 2014. 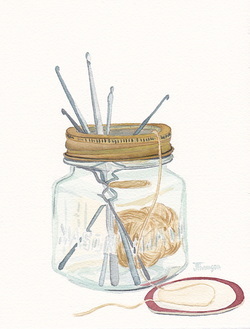 I have created 15 new 'mason jar' images. They are meant to stimulate thought as well as be visually interesting and even beautiful. Thanks again for your interest and your support. I hope to make you glad of your offer! This little painting is an early one. 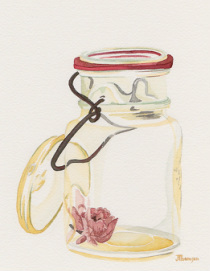 Mason Jar with Dried Rose. 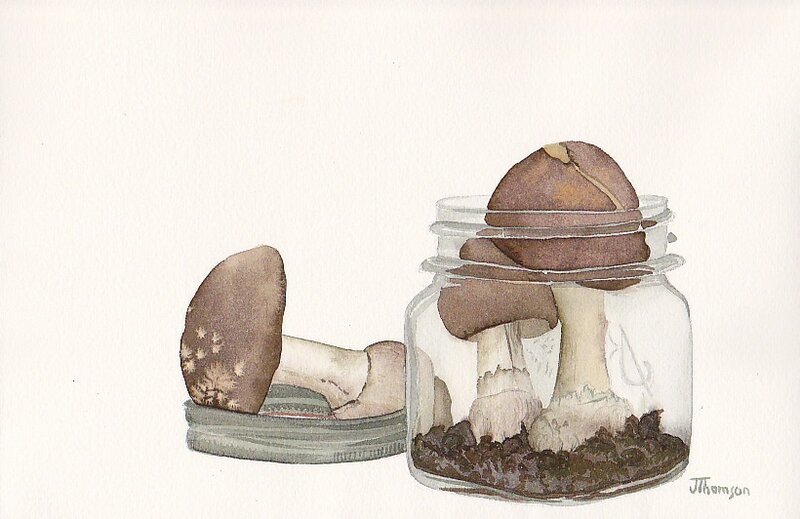 6 X 7.5 inches, watercolour on paper. 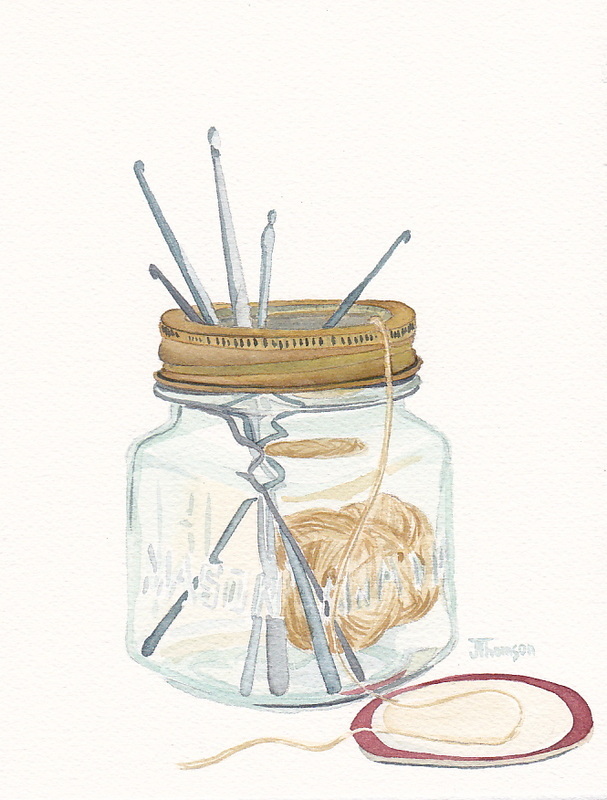 As I was painting this I was contemplating my Grandmother Preetzman's stories about pioneer life. How hard she had to work to survive and to ensure the survival of her family. She was quite vocal about her labours and all the work she had to do and how it wore her out. I know she worked very hard. I wondered when she became lost in 'the myth of her own potential'. Then my mind turned to myself, all painting is self-portrait after all, and I saw my own journey. The need to let go of 'what could have been' and enjoy what is. I used to have a sign on my studio wall. I can't remember the author now. But it was something like. "A terrible thing happens when you take responsibility for your own life. You have no one to blame." The myth of romantic love haunts me still and I think haunted my Grandmother too. The dried rose in this painting is a symbol of the desire to preserve the myth of romantic love however the lid is off now and the myth can dissipate and make room for other ideas.